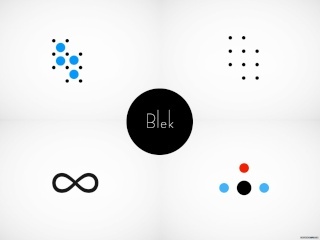 Blek is a new touch puzzle game that was originally developed by kunabi brother for touchscreen devices last year. To bring this fun and simplistic puzzler to Nintendo’s audience the artistic and innovative Austrian development team Broken Rules - best known for their fantastic platformer And Yet It Moves (WiiWare), the multiplayer partygame Chasing Aurora (Wii U eShop), the Super Turbo Championship Edition of indie megahit Guacamelee! (Wii U eShop), and the beautiful adventure Secrets of Raetikon (unfortunately no Wii U release) – stepped in and ported over a technically perfect Wii U version! 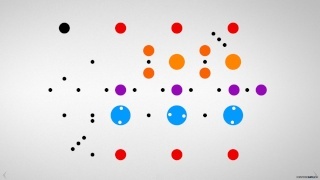 The gameplay is simple: There are colored spheres and black orbs on the screen, and your goal is to get all colored ones while avoiding the black ones. To get it done you draw a line, a path, on the touchscreen. When you release the touchscreen or when you pick up the first colored sphere you lose control of your line - but it will continue to move on. It just copy-pastes the pattern you just drew 1:1 and loops it endlessly. If you’re path was thoughtful, your line will collect all the spheres and move on to the next stage. If not, it will hit the black orbs or leave the area. There’s no penalty though. You have as many tries as you wish. It is a very casual and zen-like experience: No time limits. No scores. Just 60 stages that get harder gradually. The simple first levels gently tutor you into fun beginner levels, but it eventually leads to a few additional objects that add some variety and real brain workouts later on, culminating in a final stage with a special twist. It’s a nice package but it’s all over too soon! When I compare Blek to other innovative and fun puzzle games on the Wii U eShop, like Art of Balance (9/10) and Color Zen (8/10), it feels a bit short. Blek is not an overpriced 30 minute game though. It took me 5 hours of gameplay to beat all 60 stages which is decent value for the price, but it could have easily been richer in content (more eye-candy and music would have been nice too). The first stages are solved in a matter of seconds, but time sure flies by working out solutions for some of the later stages. You beat the stages one by one, and you can go back and select all the ones you previously won but there isn’t much to come back for other than finding different solutions or doodling for fun. Yet there’s a spark of magic seeing your drawings come to life while making the sounds of a soothing wind. The effect is really nice. Blek is a fun pick-up & play game with great appeal for puzzle fans. It’s a nice time-waster for multiple people taking turns as well. A group of people can enjoy watching it on the big tv screen as someone else is playing on the GamePad. Everyone who can hold a pen and draw a line is able to play Blek. Try it! @SKTTR Please add your score. I got feedback from the developer and feel the need to make clear that 7/10 means either good game, or very good game with some issues. On a 10-point scale, everything 6/10 and above gets my green light, while 5/10 is just an average game (NOT a bad game). I rate bad games between 4/10 and 1/10. That's just the way a 10-point system works best. Fortunately I hadn't to review a bad game on this site yet. Well, with the exception of 3DS Color Zen Kids which was disappointing on many levels compared to the original. There's a stupid trend that people dismiss anything that scores 7/10 or lower, with 8/10 being something like a magical barrier for games to get recognized. These trends do not apply to my reviews. Anything 6/10 and above is a potentially good game. Coming back to Blek, the 7/10 materialized as I was comparing Blek to other high quality puzzlers on the Wii U eShop. - Art of Balance (9/10) 200+ levels, different multiplayer modes, online, beautiful graphics and music. - Pullblox World (9/10) unlimited levels, level editor, online, beautiful graphics and music. - Tetrobot and Co. (8/10) Another simple concept pimped to great effect with a nice presentation, a story, content, and variety. As mentioned in the review, the content is Blek's only problem, for me personally. I hoped to get that across. And so it's a 7/10. I think it's a fair score in respect to other developers who made "richer" puzzle games on Wii U.
Blek sound fun! Might download if become available in my land!